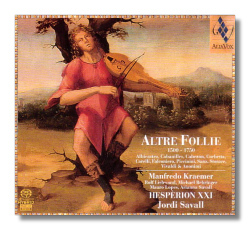 Following the success of Savall's first volume of 'La Follia' compositions (AliaVox AV9805), it was a foregone conclusion that sooner or later, a second instalment would be compiled. Well here it now is in all its splendour and glory. The first disc covered compositions between 1490 and 1701 with this album slightly wider time spectrum: 1500 to 1750. The composers include some very well known names like Corelli, Vivaldi, Piccinini and Mundana. De Cabezón, Ruffo, Falconiero, Storace, Playford, Sanz, Corbetta, Cabanilles, Albicastro and De Murcia are maybe less famous but nonetheless, their music is as beautiful and inventive as the others. Savall also includes two anonymous pieces which should generate a lot of enthusiasm; the 'Folias criollas' from Peru (track 1) is particularly exciting. We have now become accustomed to the luscious presentations from AliaVox and this latest issue is of the same high standards. What I particularly like about this label is that each album is not only a feast for the ears but for the eyes as well. Although playing time is very generous, the music is so engrossingly ethereal that one does not even realize that the journey has come to an end. Two and a half centuries really do fly by with Savall's annotations once again a treasure trove of historic information that go part and parcel with the wonderful music on offer.